Home > Don’t just dream it, do it! Only you can make your life healthy, meaningful & compassionate. A Sydney friend recently recounted the story of her attempt to fulfill a simple task: buying some bread on the way home. The multiple obstacles encountered for such a simple task made me want to curl up in foetal position. With her three kids in the car, she recounted the tale of traffic, no parking, road rage, frantically searching for coins to put in the parking metre and once a spot was actually found, the queues at the supermarket check out and rushing back to the car before the metre ran out. Meanwhile let’s not even mention what the kids were up to in the back of the car. If such simple life tasks require that level of mental, physical and emotional effort, what is the accumulated effect on our nervous systems, and that of our children who are absorbing it all? 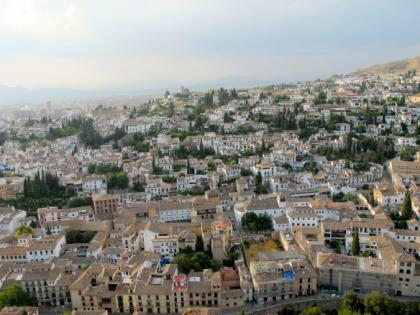 From the ivory tower (literally – well it is actually white lime wash) of my rented house in the Albaicin, Granada in Spain, I am hearing my friends candidly sharing stories of their exciting and exhausting city lives. From this distance, and with my adrenals fully rested, I am seeing my home from a different perspective. My family and I have chosen to take a year off from the rigours of big city living and I am experiencing a joy of life that still contains responsibilities but without all the incidental stresses of crowds, traffic, road rage, parking metres and comparisons of haves and have-nots. In this new Spanish existence, I am unfolding with life rather than forcing, pushing and shoving my way through. Trying to get our friends here to commit to a plan even a week ahead is nigh impossible, because Spaniards like to go with the flow and “wait and see” how they feel or what else may arise in the meantime. At first this was frustrating for a planner like me but now I am slowly relaxing and trusting that life will be fine without plans. And it usually is, as you just never know where you might find yourself. Most of us in Australia have four weeks a year for holidays to rest and recuperate so the idea of taking a whole year away from the life we know seemed extreme. I thought I might get bored; I wondered how I would fill my time; what would I do if I wasn’t progressing in my profession or contributing to our future financial wellbeing. These are all real concerns but, for now, I choose not to worry about them as I see, hear, taste, smell and touch all the new wonders of this life in Granada. Of course our life here is not all roses. We have our worries about finances, about how the children are adapting to school and life, and we dearly miss parks with grass for some much needed ‘earthing’. However, I can’t say that I am stressed as such. For the first time in a very long time, I actually have space and time. Time to talk to my neighbours and have a coffee in my neighbourhood café, time to create fun family excursions on the weekends, to be creative, to read, write and explore my new city of Granada. I will worry about ‘real life’ when I return to Australia, because for now I have too many wonderful new things to experience, to test myself against, and two children to support through the trials and joys of their Spanish adventure. The trigger thin line upon which so many people precariously live in the big cities of the world is remarkable and I imagine will have long-term implications for us, and the next generation. I am not saying that big city life is all negative. Frankly, the exciting opportunities that exist in cities are unparalleled but how does one remove oneself to rest every once in a while for more than the four designated holiday weeks? I still recall the last work trip I made before moving to Spain. I was stuck for an hour in a plane waiting to take off from Melbourne airport while a large thunderstorm passed overhead. For the man sitting next to me, it was the straw that broke the camel’s back after what must have been a big week of work. Understandably he was keen to return home to his infant son, but nature had other plans and this man proceeded to ‘lose it’! The man, who was wearing a smart business suit, began loudly abusing the Qantas flight attendants for their tardiness and for preventing him getting home to his son. The situation symbolised so much to me: people living too close to their limit within a tightly controlled environment - that if anything slightly alters from their expectations, they completely lose it. I remember feeling incredulous that this man was taking out his frustration on someone who had no control over the situation, yet I also had compassion for that man who clearly had a lot going on in his life. I made a mental note to myself that I never wanted to live that close to my stress threshold. Perhaps, from some perspectives that means not ‘getting ahead’ in life or ‘challenging’ myself but at least it is an active choice on my part to live that way. The only thing I am trying to say in all of this is, if you have choices - as many of us do in the developed world - go exercise those choices in the most authentic way that affirms a healthy, meaningful and compassionate life. ‘Our Year in Spain’ is an expression of living a different choice, of creating an opportunity that was important to my husband and me. I am very proud that we managed to pull off this feat without damaging (that we know of thus far) our children or bankrupting ourselves in the process. So far we have only gained from this experience – a new perspective, a new language, friends, knowledge and understanding. Whatever the dream is for you, use your mighty brain and resources to find a way to do it. 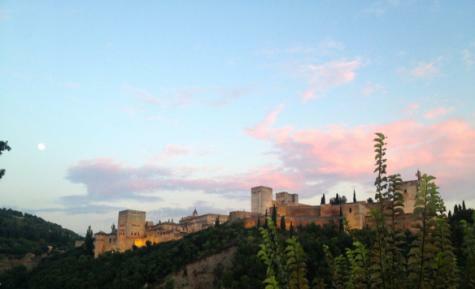 The reverse of the main picture: the Albaicin neighbourhood from the Alhambra. This is all very well for Bianca and her family. For a start, it seems she can stay there easily, open banks, work and so forth as passports are not an issue. It sounds like her husband spoke the language before they even got there, and while she says “use your mighty brain and resources”, not everyone has the resources or the type of work that allows this. We can’t just all pack up for a year and leave. There are many other things to be taken into account such as saving enough money in the first place (some of us barely get by Bianca), interests of children, employment when you return, parents and more.